The text presents some documents, which probably make clear, that the "monk-of-Reichenbach hypothesis" had gone wrong, and that we have it to do with a German book-trader in Italy already since 1452. Then stays, that Cusanus as the single German cardinal surely hadn't a problem to get careful researched map data from German cloisters and Cusanus (not to forget the engagement of Bessarion) had a lot of experience to get content from German libraries to Italy ... well, they had the best considerable person, Regiomontanus. In the question of production and distribution he surely wasn't disinterested in the experience of a German book-trader in Italy, who then naturally learned the astronomical business. And Regiomontanus learned about book production, becoming a publisher himself in 1472. I don't know, what is meant by "Nicolaus Hahn". According this Nicolaus Laurentii is the dominating printer in Florence, surpassed by the nunnery printing house of San Jacopo in Ripoli, but this was installed by Laurentii himself and Johann Petri in 1476, so it probably wasn't a competing printing house, but somehow simply based on partnership or another arrangement between the printers. Johann Petri worked in it probably helped by the nuns. First Johann Petri worked independent in Florence (1471-1473), then Nicolaus Laurentii appeared and Petri stopped his business. Johann Petri reappeared 1485, when Ripoli had stopped in 1484 and Laurentii stopped in 1485. Totally Johann Petri is known from 224 own or partnership prints (the Ripoli-prints not counted; in Florence 146 are noted, others are from Basel, Passau and from Ferrara - it's not sure, if these are from the same printer), there are not much printers who have worked more. There are other printers with the name "Petri", probably a family originally from Mainz. From 1470-1480, 11 years, appeared about 125 texts in Florence (some are insecure and have an unknown origin), from this 110 (nearly 90 %) are given to Nicolaus Laurentii, Johann Petri or to the nuns of Ripoli (actually they might have done some more of the "unknown group"). Since 1481 the foreign competition is rising. The numbers of 1480, 1485, 1490, 1495 and 1500 are probably too high (and all others too low), cause some dates are only estimated and mostly given to round numbers. For the Berlinghieri atlas the database gives the estimation "not after 1480". Considering this as "true", the printing passivity of Laurentii in 1479 is interesting (only 2 editions), it might have been a year, in which he focused on the production of the atlas - and so hadn't much time for other projects. Just to getting an overview, how book printing had been distributed in 1500, I made a list of the data given in the database. I did this in regard to our specific Bologna theme. I would think from this data, that Bologna isn't especially well developed in printing industry. Considering it's size, it behaves somehow normal, not too bad, not too good. Venice looks good, of course. Ferrara looks relatively bad, astonishingly. Probably due to the condition, that it suffered by war in the 1480's. Florence - considering it's cultural weight - looks "only" normal. Comparing it with Nurremberg, from which I imagined, that it was rather strong, but actually it wasn't somehow, inside the German cities it hadn't so much printings. Nurremberg had 25.000 inhabitants, Florence maybe 60.000, and Nurremberg had more. By this ratio Nurremberg would get 2.5 against 1 for Florence. Cologne, that surprises me, has nearly as much as the 6 largest Dutch/Belgian cities. The Dutch/Belgian region is very strong in copperplate engraving. Cologne surely profited from the condition, that it is rather near to Mainz. Mainz itself has not so much, probably it suffered strongly from the attack in 1462. Vienna is astonishing weak - surely that has a reason in the condition, that Ulricus Han was with success hunted out of the city in 1462. The anti-printing league was strong in Vienna. Well, the quality of the objects, which are counted, differed, so the list has only relative worth, perhaps a comparison of printed pages would show another result. At an English page it's said, that an average of 18 copies of each "Wiegendruck" survived. Also it's estimated, that 10% are not known, though I would think, that this number should be higher. And these "rare" or "not surviving texts" naturally would decrease the average, if they are included. I only took cities with more than 100 printed texts. Hi Huck. I have been suggesting that the finished engravings, with lettering, were printed in Venice, not Bologna. That's why I posted the two illuminated printed pages published in Venice. That's where Lazarelli bought them. At most a small proof run would have been done in Bologna, without lettering. I am only suggesting that the "Mantegna" was designed in Bologna; and that perhaps the plates were made there, probably by a Florentine engraver who perhaps added the backgrounds. I had a whole long post about the Florentine origin of the backgrounds and will have more, focusing just on engravers of pictures. (The engraver of the letters is a different matter.) It seems to me more likely that a Florentine would have worked in Bologna than in Ferrara, because of the friendly connections. Bologna is a meeting point between Florentine engraving and Ferrarese design. ... shows, that in the case of Spain there are changes between the versions of Germanus and Laurentii, but the map improved, so the differences don't tell us, that Nicolaus Germanus and Nicolo Laurentii would be different persons. Nicholas Laurentii was also called Nicolo Tedesco, meaning "Nicholas the German," Campbell (The earliest maps p. 123) says that Skelton has a refutation of the view that Donnus Nicolaus Germanus and Nicolo Tedesco were the same person. Unfortunately the facsimile edition of the Berlinghieri atlas is in reshelving limbo at the library, from the last time I looked at it (but didn't have time to copy the relevant material) on Friday. Hopefully it will surface soon. In the meantime here is part of Campbell's summary (p. 124f). The Geographia of Francesco di Nicolo Berlinghieri (1440-1501) is not an edition of Ptolemy; it is rather a description of the world in Italian verse derived from classical and contemporary sources...The origins of Berlinghieri's text have been traced back to 1465. This is at least eight years before the earliest edition of Ptolemy was set in motion, and the separate sources for the Florentine maps go back further still. The regional maps, both Ptolemaic and contemporary, take no account of Donnus Nicolaus's trapezoid projection, using instead the traditional plane projection of Marinus. Marinus of Tyre, 100 c.e., lived 50 years before Ptolemy. In his maps the degrees of latitude and longitude were equally spaced on a rectangular plane surface ("planar projection"). Ptolemy himself used two methods of projecting the surface of a sphere onto a plane: conical projection, meaning that the longitude lines curve inwards as they go toward the poles, and homeotheric projection, in which both latitude and longitude lines curve as they recede from a central point (Campbell p. 123). Donnus Nicolaus's innovation was a trapezoidal projection, meaning the longitude lines were straight but pointed inward as they approached the poles, forming the sides of a trapezoid. For his first rescension, he used only trapezoidal projections. For the second (not used in any of these printed maps) and third rescensions, he changed the world map to homeotheric but left the 26 regional maps trapezoidal. In these later rescensions, he also added contemporary non-Ptolemaic regional maps, up to five in the third rescension, These were based on Catalan maps drawn up by and for navigators, originally (1375) very good for coastlines but poor for interiors. In later editions the interiors got somewhat better. The 1477 Bologna maps used Ptolemy's conical projections. The 1478 Rome maps used Donnus Nicolaus's trapezoidal projections with Ptolemy's numbers. The 1482 Ulm maps used Donnus Nicolaus's homeotheric Ptolemaic world map (now including Greenland), his 26 Ptolemaic trapezoidal regional maps, and also 5 non-Ptolemaic contemporary maps that he designed based on Catalan-derived and other sources. The 1482 Florence maps used a homeotheric world map, but planar projections for the 26 Ptolemaic regional maps and the four contemporary maps (using similar sources as Donnus Nicolaus but not Nicolaus's addition of the North). The resulting maps tend to look similar but aren't. The two dissimilar maps you posted, Huck, are Ptolemaic vs. contemporary, where the difference is obvious. But planar projections, even though they look similar, are less useful, because the same number of degrees of longitude (spaced equally on the map) don't correspond to the same distance in the world. Donnus Nicolaus might have put up with Berlinghieri's erudite but non-cartographic hexameters, but it seems to me highly unlikely that he would have disregarded both his own projection method and Ptolemy's, and instead used a different and inferior method of converting Ptolemy's numbers into visual terms. He may have had some influence at the beginning of the Florence project, because of the homeotheric world map, but not while the regional maps were being done. I can easily imagine him throwing up his hands in disgust and grabbing at the opportunity to head south and help finish Sweynheim's work, which is where Skelton's document says he went in 1477. Campbell estimates that the maps were done by 1479, ahead of Berlinghieri's text. That is my conclusion using Campbell. If I ever locate the Skelton, I will see what he says. Hind has an interesting rejected suggestion as to de Laurentii's engraver. He suggests Francesco Rosselli, but then rejects him because it is known that he went to Hungary in 1480-1482. But Hind was assuming unjusifiably that the maps were done last. Rosselli did his own atlas a few years later and was known more in his day as a cartographer and printer than as an engraver. Today, of course, he is best known for his "trionfi" engraving series, reproduced in Kaplan and numerous places on the Web. Campbell says that Rosselli's own atlas was far too meticulous to have been done by the same careless engraver who did the maps for de Laurentii. For example, the engraver began to write "Gallia" above Spain, then crossed it out and wrote "Hispania." Well, maybe he was learning. Or a different person did the lettering than did the coastlines,forests, and mountains. Another thought on your printing statistics. For the "Mantegna," what is relevant is printings of engravings, not printings of books. In Florence there was a big resistance to printed books, fueled by the humanists, who stood to lose jobs. Yet it was far ahead of the rest of Italy, especially before 1470, in the production of engravings not in books. It also pioneered engravings in books, perhaps one way to sidestep opposition, since the humanists did not appear to object to engravings. Now I am ready to post a few engravings that seem to me similar in style to the backgrounds of the "Mantegna," and also, to an extent, to the 1478 Rome Ptolemy. First, here is a ""Triumph of Love" dated by Hind 1460-1470. He speculates that it is one of the last works of Finiguerra, as the following engravings in the series aren't up to the same standard. It is Plate 18 of Hind 1938. What you see is not a good reproduction; the librarian copied it on an ordinary copier (not a scanner; unfortunately the library decided scanning would be too hard on the book's binding), and I scanned that. The result below is fuzzier than it appears in Hind. The original is in Vienna, Hind says, along with the other five of the series--the Albertina, I think he means, where the Vienna Passion is, to which he sees similarities. Of the disparity between this Triumph and the ones that follow it in the series, Hind says "The circumstance seems to indicate the death of an engraver, and the continuance of his workshop in less skilled hands, as one might imagine the circumstances in the Finiguerra workshop after Maso's death" (I, p. 33). Another explanation, it seems to me, might be that the artist got a better job somewhere else, up north. 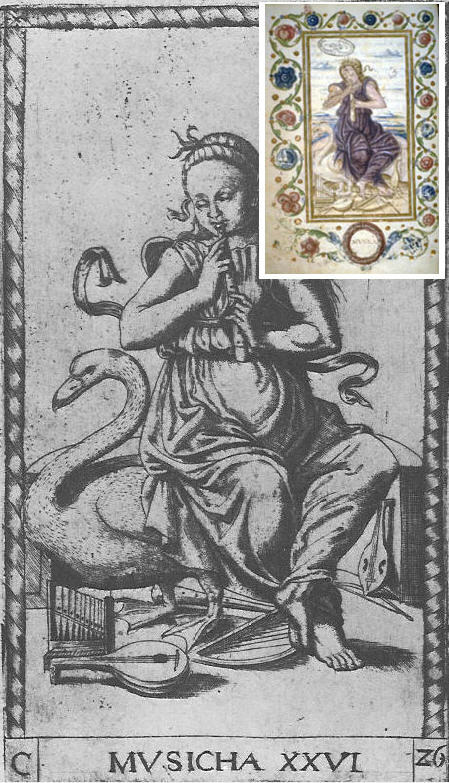 Hind compares the Cupid in this Triumph to the Cupid of the Planet Venus in the "planets" series now attributed to Baldini, but then to Finiguerra, and dated 1460-1464 because of the1465 calendar attached to a copy of the series made later. Lambert goes so far as definitely to attribute the "triumph" series to the artist of the Vienna Passion (ignoring the distinction between "Love" and the others). What strikes me in this engraving as comparable to the "Mantegna" are the trees, the hills, the water, the clouds, the shading of the robes, and the general liveliness of the figures. They are similar to those of Gozzolli and also to those of the "Mantegna." It seems to me a better match than the 1478 Rome Ptolemy, which is simplistic by comparison. 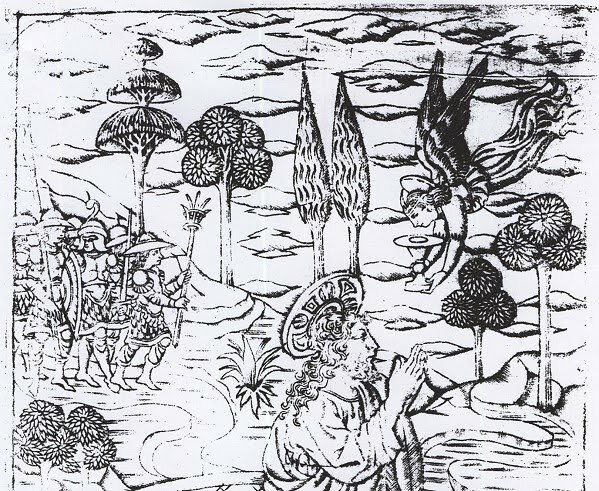 Another engraving, Plate 88 in HInd, which he dates to 1460, has the same kind of shading on its trees as the 1478 Rome Ptolemy and the three extra cards added to the Virtues in the "Mantegna," which I post again below the engraving. And one more Florentine engraving, the top half of an "Agony in the Garden," Plate 25 in Hind, which he dates 1460-1470, for its trees, hills, and clouds. Another example, for the same features as the last, is the background of the "Children of Luna" that I posted on the " Project Festival 1475" thread, viewtopic.php?f=11&t=418&start=10#p6169. Hind noticed similarities between the "planets" and this "Triumph of Love," attributing them to the same artist or workshop, Finaguera--an attribution that Lambert does not accept). Hind says that the Cupid on "Love" is the same as the Cupid on "Venus," just posed differently; but the resemblance looks pretty generic to me. 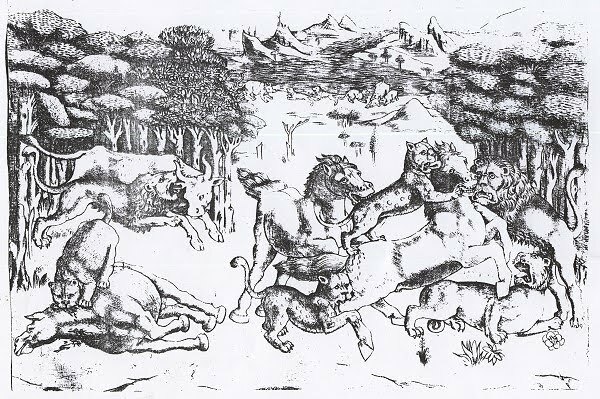 I am not sure why Hind did not himself point to these Florentine engravings when trying to identify the engraver of the "Mantegna." Perhaps he was misled by the "Mantegna"'s lettering, which I think was added later. At some point I will look at samples of lettering to try to guess its style and origin. Mantegna Tarocchi e-series, 1-10 persons, nearly no landscape. 21-27, Liberal arts, IMPORTANT, has usually no landscapes, but at 24 geometry and 27 poetry. Also IMPORTANT, 24 is painted on a cloud. IT HAS NO LANDSCAPE AT 26. Unluckily we don't have all Lazzarelli pictures. * and the 5 others, between them Athena as philosophy. About the Philosophia=Athena we don't know, but we have the other 4 and at least 3 of them have something like landscapes - Neptun has only water, Juno lives in the air ... possibly these four present elements, Pluto=Fire and Victory=earth, similar as it appears in the Minchiate. As Juno presents air, it has no landscape. Lazzarelli has a landscape at 26, but the Mantegna Tarocchi e-series has not. I forgot, that we've also some Lazzarelli pictures in Kaplan 1, page 27, totally 9 pictures. Though, they don't change the observation. From my perspective this seems to indicate, that the landscapes came from Lazzarelli's painter. Sweynheim's virtues from 1468 hadn't a landscape. The Bolognese figures from 1467 hadn't. Would be nice to see, if Lazzarelli's Athena had a landscape. mikeh wrote: Hi Huck. I have been suggesting that the finished engravings, with lettering, were printed in Venice, not Bologna. That's why I posted the two illuminated printed pages published in Venice. That's where Lazarelli bought them. At most a small proof run would have been done in Bologna, without lettering. I am only suggesting that the "Mantegna" was designed in Bologna; and that perhaps the plates were made there, probably by a Florentine engraver who perhaps added the backgrounds. There is some argumentation (not from your side), that Bologna was predestined for "early printing" and "early playing cards". The observable documents for playing cards are not much ... and the number of the Incunables is also not high, just usual, not extreme high. On the whole, I am still back a few posts. My Internet connection has been dying, and the repairman couldn't come til today. I don't know about American technique, but often it helps to cut the energy off the rooter (causing a reset) and to reconnect it after a few seconds. Nicholas Laurentii was also called Nicolo Tedesco, meaning "Nicholas the German," Campbell (The earliest maps p. 123) says that Skelton has a refutation of the view that Donnus Nicolaus Germanus and Nicolo Tedesco were the same person. You noted already, that he spoke of a scribe and typesetter in Mantova 1471. I've already adapted this as possibly belonging to both persons. Nicolaus Laurentii had to learn printing. Why shouldn't he had done it in Mantova from the German printer Vurster? The documents of Ferrara make clear, that a connection between Crivelli and the researched person had existed already from 1452-1466 ... the researched person had been a book trader (and probably also a book producer), Crivelli had various commissions from him and got also material. From this the hypothesis of a monk of a cloister 1456 in Germany has died. The astronomical data was gotten from elsewhere, probably most simple from the circle Cusanus-Bessarion-Regiomontanus, who had this strong interest in Ptolemy. Regiomontanus arrived at end of 1461, so the project might have started in 1462 ... the year, which appeared in Crivelli's edition of 1477. And it might have been indeed, that Crivelli made maps in this year - or had at least one made ready in 1462. The maps of Germanus aren't all equal, they variate and were improved - for instance the Groenland detail is not in all editions and it is not everywhere the same. Looking at the date 1452 (Emperor in Italy for marriage reasons), it seems plausible, that the researched person came with the entourage of the emperor (another possibility it would be, that he arrived with the Jubilee year) - and had the commission to buy interesting luxury manuscripts for rich German consumers in Italy, possibly also other diplomatic missions. Breslau (the region, where Nicolaus Laurentii came from) belonged to Bohemia. The young king of Bohemia, Ladislaus posthumus, accompanied the emperor in 1452, it might well be, that also Bohemians were in the entourage. to ornament the Grammar of Donatus, Breviaries, Missals, etc. with initial letters, scrolls, small and large miniatures". The Emperor was in Ferrara, cause Borso wished the duke title of Modena and Reggio, which he got. In Ferrara was (probably) Crivelli. Wiki: "When Cosimo de' Medici wished to create the Laurentian Library of Florence, Vespasiano advised him and sent him by Tommaso Parentucelli (later Pope Nicholas V) a systematic catalogue, which became the plan of the new collection. In twenty-two months Vespasiano had 200 volumes made for Cosimo by twenty-five copyists. Most of them were, under the circumstances, books of theology and liturgical chant. He had performed important services for the diffusion of classical authors when Nicholas V, the true founder of the Vatican Library, became pope. He devoted fourteen years to collecting the library of Federico da Montefeltro, the Duke of Urbino, organizing it in a quite modern manner; it contained the catalogues of the Vatican, of San Marco, Florence, of the Visconti Library at Pavia, and Oxford." It seems probable, that the Northern kings and dukes in 1452 saw this development with interest and searched for ways to copy the system - and left one or more agents in Italy to observe the market. The researched person is given as "Maistro nicolo todesco cartolaro" ... a cartolario means in modern Italian a copy book, so there is some chance, that cartolaro meant a copyist. In Mantova (1471-74) in Vurster's printshop he had opportunity to become acquainted with Domenico de Lapis - who worked for Vurster some time as editor before becoming an editor himself. As a reward Eugene IV nominated him cardinal; but Nicholas declined the dignity. It needed a command of the next pope, Nicholas V, to bring him to Rome for the acceptance of this honour. In 1449 he was proclaimed cardinal-priest of the title of St. Peter ad Vincula. His new dignity was fraught with labours and crosses. The Diocese of Brixen, the see of which was vacant, needed a reformer. The Cardinal of Cusa was appointed (1450), but, owing to the opposition of the chapter and of Sigmund, Duke of Austria and Count of the Tyrol, could not take possession of the see until two years later. In the meantime the cardinal was sent by Nicholas V, as papal legate, to Northern Germany and the Netherlands. He was to preach the Jubilee indulgence and to promote the crusade against the Turks; to visit, reform, and correct parishes, monasteries, hospitals; to endeavour to reunite the Hussites with the Church; to end the dissensions between the Duke of Cleve and the Archbishop of Cologne; and to treat with the Duke of Burgundy with a view to peace between England and France. He crossed the Brenner in January, 1451, held a provincial synod at Salzburg, visited Vienna, Munich, Ratisbon, and Nuremberg, held a diocesan synod at Bamberg, presided over the provincial chapter of the Benedictines at Würzburg, and reformed the monasteries in the Dioceses of Erfurt, Thuringia, Magdeburg, Hildesheim, and Minden. Through the Netherlands he was accompanied by his friend Denys the Carthusian. In 1452 he concluded his visitations by holding a provincial synod at Cologne. 1451: Der größte Philosoph des Spätmittelalters Nikolaus von Kues (1401-1464), Bischof von Brixen und Kardinal, kommt am 29. Juni nach Erfurt und hält sich bis in den Juli hinein bei den Benediktinern auf dem Petersberg auf. Er predigt vor großen Menschenmengen sowohl auf dem Petersberg als auch an den Domkavaten, verkündet Ablässe und visitiert Erfurter Klöster. The cloisters of Erfurt are mentioned as collecting astronomical and geographical data. The map of Cusanus, which later became part of the Ptolemy, is said to have been ca. 1451, probably Cusanus simply got it in 1451 or got data, which made it possible to construct the map. (using similar sources as Donnus Nicolaus but not Nicolaus's addition of the North). Donnus Nicolaus might have put up with Berlinghieri's erudite but non-cartographic hexameters, but it seems to me highly unlikely that he would have disregarded both his own projection method and Ptolemy's, and instead used a different and inferior method of converting Ptolemy's numbers into visual terms. Actually it's said, that Berlinghieri made the map for the Osmanic sultan - what looks rather curios. Generally later maps were regarded as "secret" ... perhaps there was an early idea of similar intention to fill the Osmanic mind with wrong data about the nature of the world. No Groenland, and the Northern cities (possible objects to the hungry expansive interest of the Osmans) seem to have greater distances between them as they actually had - so they looked more difficult to approach and attack. It's said, that the defeat of the Spanish Armada still partly went back to bad maps about England. In August 1480 Otranto was attacked by a large Osmanic army, after Venice had signed a peace treaty after a long war in 1479. Other smaller places followed. Osmanic danger and interests in the Ptelomy run parallel already in the 50's. Berlinghieri map and the attack on Otranto are running rather astonishingly parallel. I've to add a few things, having researched "Johannes Petri", who is in the research a similar phenomenon as Nicolaus Laurentii Alemanus and Donnus Nicolaus Germanus (which may be only one man). There's a Johannes Petri in Florence ... this is the one, who knew Nicolaus Laurentii and worked independently 1472/73 and then probably in the printshop nunnery of Jacobo of Ripoli till 1484. In the longer relation between the Nicolaus Laurentii it's the impression of the observer, that Nicolaus Laurentii is mightier than Johannes Petri, but both printing shops seem to work somehow together. The correlating phenomenon is, that both shops finished their activity around the same time (1484/85), possibly according the condition, that Nicolaus Laurentii ended his activity, either caused by retirement or death or sickness. In 1486 Johannes Petri reappears in Florence for a single printing as an independent printer. Then this is repeated in April 1490 for another edition, and then follows a long and intensive cooperation with a Laurentius de Morgianis, who is constantly named as the first and then followed by "Johannis Petri". Laurentius de Morgianis has 170 printings (so rather much) in 15th century and the most (after a rough overview) maybe 85% were made in combination with Johann Petri, who has totally 146 printings in Florence, and only made a handful in independent manner (I found only 1 between 1491-1500). The Johann Petri from Passau started to work 1485 and prints till 1497 totally 70 editions ... but the production slows down from 1491-1497 with only 8 editions in 7 years, mostly only repeatings of earlier editions. The context of both lifes give the condition, as if the Johann Petri is one man, active in two cities, with a major stay in Passau between 1485-1490 and all the other time in Florence, somehow managing, that the Passau printing house still worked occasionally between 1491-97. From the 3rd "Johann Petri" we've the data that he came to Basel some time after 1460 and received citizen rights in 1488 - with no word, what he might have done in the meantime. In 1500 it must have come to a agreement with the printer Amerbach and then Amerbach, Froben and the Basel Johann Petri worked together - I found one Amerbach-Petri cooperative book project said to be from before 1489, possibly around the time, when the Basel Johann Petri got the citizen rights in Basel 1488. Wenn aber der sonst so bescheidene Koberger mit gerechtem Selbstgefühl (21. März 1502) schreiben kann, daß auf ihm, Amerbach und Johann Petri fast ausschließlich der deutsche Buchhandel ruhe, so läßt sich doch voraussetzen, daß die kleinern Verleger und Buchführer, schon damals so gut wie später, dem Beispiel der großen gefolgt sind und regelmäßig die Messe besucht haben; denn obgleich der buchhändlerische Meßbesuch ebenso gut den Verkehr mit dem großen Publikum, anfänglich wohl sogar ausschließlich, ins Auge faßte, so mußten doch jene Kleinen immerhin die Hauptabnehmer für diese Großen sein. ... Koberger expresses, that Amerbach, Koberger himself and the Basel Johann Petri were the most important men in the German book trade. How could he tell so? Amerbach (166 book productions in 15th century), Koberger (262 book productions in 15th century) and only a handful of book productions known by the Basel Johann Petri would construct a not even picture between the 3, which only gets a face, if I put all 3 "Johann Petri's" together and regard them as "one man" only and have then for this person 224 plus a number of ca. 125 productions in the nunnery of Ripoli in Florence and under this condition I really see an impressive man of much experience and influence. The picture, that the Florentine printer "Johann Petri" had been all the time in Florence, was generated by the impressi of these 140 cooperative productions with Laurentius de Morgianis in the 1490's in Florence with the perspective, that Johann Petri was the humble eager printing workman in the background and Laurentius the chief of it. But the whole in context gives the impression, that Johann Petri around 1484, when Nicolaus Laurentii retired, was the logical heir of a lot of business connections created by Nicolaus, with enough personal experience about printing and also owner of a lot of material necessary for printing, also having a lot of capital in form of unsold editions. In this situation he probably decided to hire some of his printing material to other printers in Florence and saw it as necessary to combine Italian and German market. He attempted to work in Passau, but finally decided for Basel as the better place - meanwhile he developed his Florence position to a cooperation with the printer Laurentius. He constantly worked on the basic of "cooperation" (Froben, Amerbach, Koberger, in Passau occasionally even with printers in Venice and Ferrara) as the better part of the business and became successful with it, similar worked Koberger. Koberger's printing house died finally, Petri's survived and still lives today. A rather astonishing career. His master was, if my analysis didn't get wrong, nobody else than Donnus Nicolaus Germanus, already in the book production business around 1452, also observable to work with cooperation models already in 1452 (Crivelli). ... confirms the identity between the Johann Petri in Passau with the Johann Petri in Basel. "The Ripoli press is renowned for its Diario (account book), in which the procurator Fra Domenico da Pistoia recorded his dealings with a colorful cast of local peddlers, charlatans, and canterini who hawked his printed pamphlets through the streets of Florence on consignment or commission." Florence, at the monastery of San Jacopo di Ripoli, 1477." In this case I would think, that it seems likely, that he participated in the print shop of Nicolaus Laurentii till its end in 1485. The database results of Laurentius Morgianis with Johann Petri 1498-1500 in the database are more or less suspect. It might well be, that they all are errors or only estimations, texts without clear date. A possible reason: They printed a lot of the Savonarola texts before and life had become difficult for Savonarolians already in 1497. I couldn't detect the printer name "Laurentius Morgianis" in reference to years after 1500. So it might be suspected, that the printer activity of the both in Florence ended in 1497/98. The Savonarola engagement possibly gave a reason for Johann Petri to leave his older past behind, now calling himself Johann Petri of Langenfeld instead of the earlier Johann Petri of Moguntia. And was working finally in Germany, far away from the dangerous pope Alexander VI. about their origin. They talk of a 1488 founding of the printing house, which more or less is in the database astonishingly passive in the first decade of its existence. Or are you supposing that this one, too, was done by Sweynheim in 1468? If so, he must have already done all the Liberal Arts engravings by 1468, for Lazarelli's illuminator to have added the landscapes. And then there are the engravings that do have landscapes. Are you supposing that they, too, were done by Sweynheim in 1468 (in Ferrarese style for the figures and Florentine style for the landscapes) and Lazarelli's painter changed them to look more in comformity with 1475's styles? 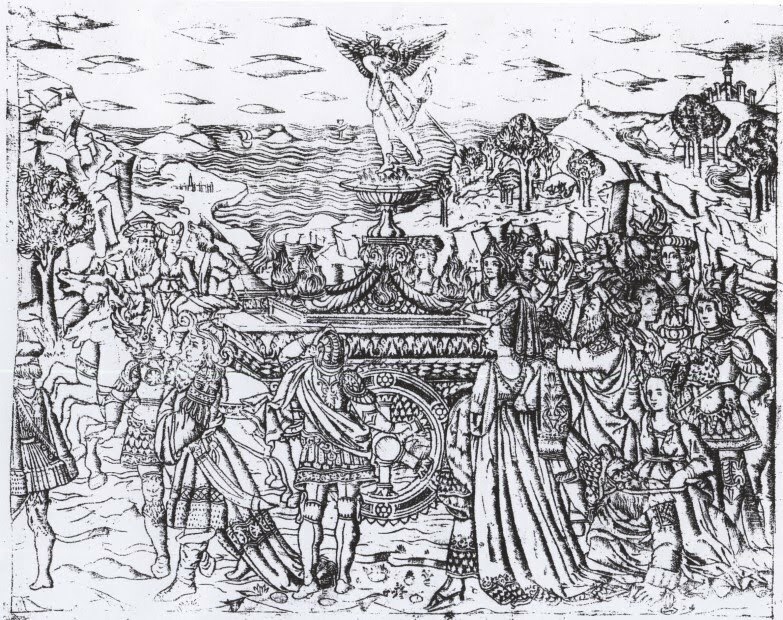 Or did Lazarelli' find prints by someone else in Venice and give them to his illuminator who redid them with 1475-era clouds, etc., and later Sweynheim's engraver redid them 1460's Florentine style? I am just trying to understand your position, for the process you think went on: 4 Sweynheim engravings by 1468, then many prints in Venice 1468-69, from which come 27 illuminations by 1471 and 7 more a little later, and finaly more Sweynheim engravings in the 1468 style by 1474. I would assume, that Lazzarelli's findings not naturally had landscapes. The edition made for Urbino had them for most pictures. The manuscript was given to Montefeltro probably in autumn 1474 or a little later after his success at the papal military action - when he got the title duke. The papal circle had opportunity to copy them (or Lorenzo Zane had opportunity) - or possibly there was a second manuscript already ready. As far I remember, there are 2 manuscripts surviving, I can't say, if both had pictures. Interesting question. There are 4 landscapes, of which we don't know, if these were from Lazzarelli. 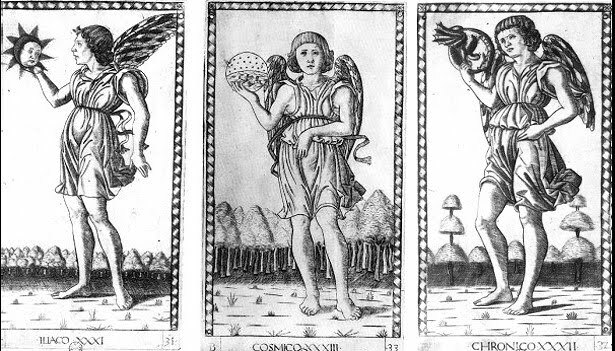 Iliaco - Chronico - Cosmico and Geometria. It's my impression, that Iliaco - Cosmico - Chronico are Roman additions in the concept, and that these landscapes - which actually are only trees, not really landscapes - are added in Rome. From the other landscapes only poetry is rather spare with details, just a mountain with a tree on it (again a tree) - at Lazzarelli's version and the e-series version. The Mantegna Tarocchi is rather special with the artes liberalis. Poetry is declared the highest artes liberales - Lazzarelli is a poet and in the construction of his poem he somehow realizes Music and Poetry as central elements. 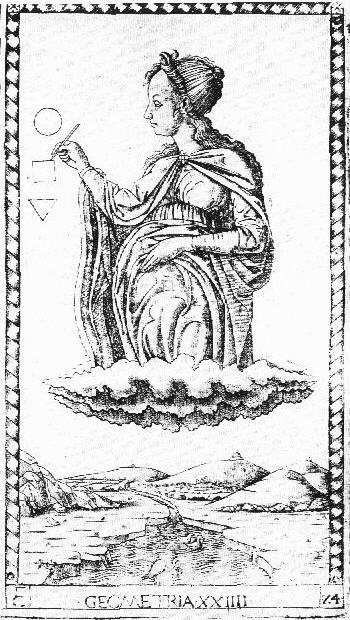 Usually the highest art is astronomy, but in the Mantegna Tarocchi astronomy is left aside and poetry is followed by Philosophia and Astrologia - then Theologia. Lorenzo Zane is said to have been a friend of astrology, he used it as a motif for his private coin. The tree might be interpreted as a homosexual symbol - the Accademia Romana and its poets had a lot with homosexuality to do, it was part of the accusations from Paul II. The 3 figures with wings look a little bit like male prostitutes. It stays as "Sweynheim's landscape invention" the background of Geometria - a river comes from mountains, which look a little bit like pyramids, into a lake or the sea and there are some beards in the water (ducks and a stork or crane ? ), the unusual cloud is somehow taken from the Martianus Capella pictures. I made an error about Lazzarelli's composition ... he hadn't an "Octava Sphera", but the virtue "Hope" (Spes). The reason is unknown. Sweynheim had the 4 virtues and we don't know from anything else. But naturally he might have had other pictures ready in his map and they were discussed. The master of the playing cards loved these cranes or storks. The Bolognese emperor + Pope + servant possibly entered the collection by a Bolognese poet, who served in the Roman household of Lorenzo Zane as secretary, I forgot the name. Lazzarelli is said to have been in the same household, but the question is when, there are contradictions. Either since 1473 or 1475. Lorenzo Zane arrived 1473, but Lazzarelli had a few words made, that he was since 5 years in Rome and counting back from this statement the result was 1475, possibly since late 1474, which would have more logic (my opinion). Hanegraaff discusses this. if I don't count the trees as landscapes, then we have 4 planets, 2 artes liberales + 9 Muses as landscape pitctures from totally 50 images (15/50) and 14 of these we find again in Lazzarelli additionally a further art liberalis (Musica) and 3 of the gods, so 18/27. This seems to say, that the landscapes come from Lazzarelli ... well, it's not impossible that it had been the other way around.